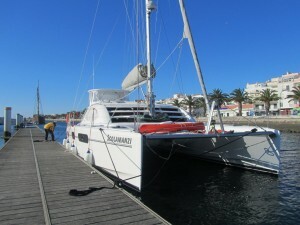 Dodging the Big Cargo Ships …Scolamanzi made it to Portugal! About the picture above … Scolamanzi is the animated ship on the left of the screen and the heaps of triangles are big cargo ships! 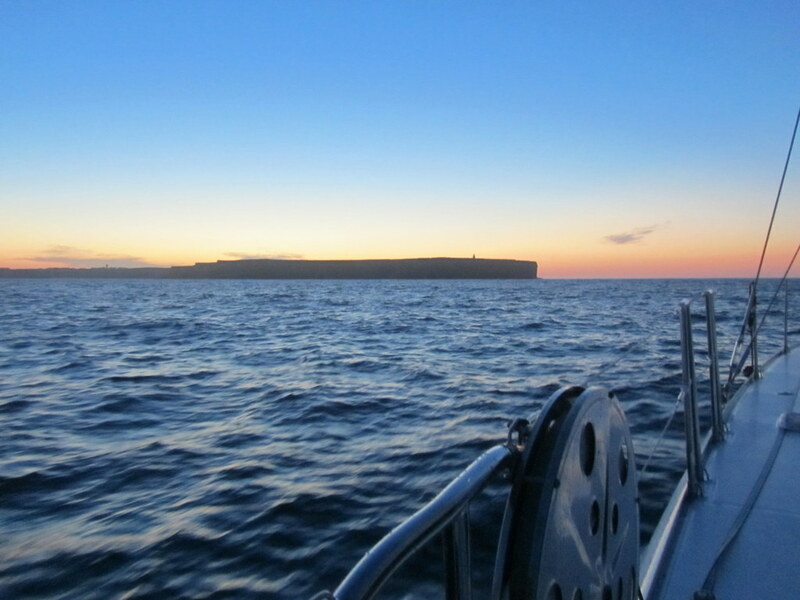 After 5 days of battling the 4 hours shifts, great sailing winds and choppy seas (which means that the speed and banging makes it hard to rest) we were desperate for a good sleep! We were getting very excited as the GPS are indicating only 8 hours more to the waypoint! 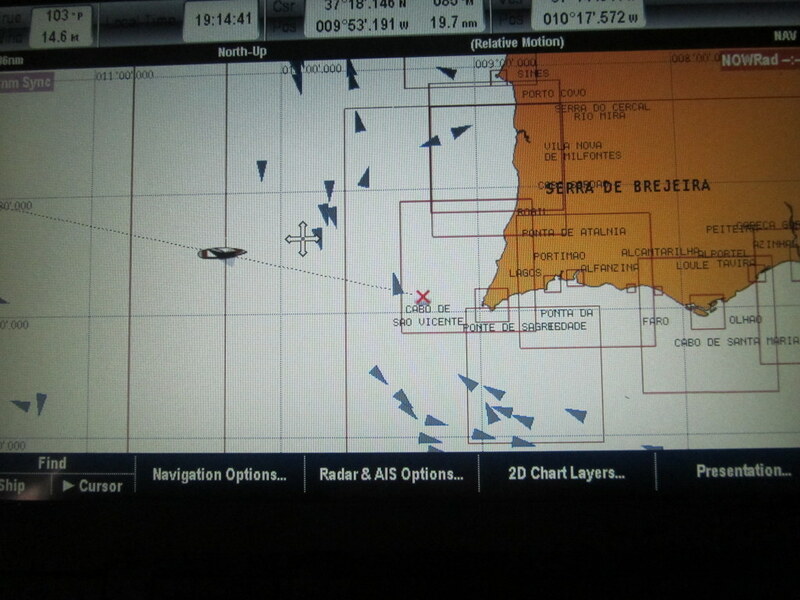 The last 5 hours of the crossing from the Azores (Ponta Delgada) to Lagos appeared to be the most challenging part of this journey so far – trying to get through the Traffic Separation Schemes! Now … I need you to get this picture clear: The “traffic” is actually mostly huge cargo vessels, doing anything between 12 and 16 knots and would be up to 850 ft long. They are in a stream of 15 to 25 boats going the one way and the same for the other stream going the opposite way! There is no way one of them could stop or linger to let a small yacht through this constant stream of vessels( the size of a mountain in comparison to our yacht)! We arrived at this traffic zone – hitting it parallel and need to get across both lanes to make it to the coast line (where the big ships don’t and can’t go because it is too shallow for them! We planned to then just hug the coast line till we get to Lagos) We arrived at this traffic junction at 2am and in extremely dark sliver moon conditions! The radar and AIS showed an enormous amount of boats and there was a very slight gap (for an overly positive opportunist!) between two groups of ships. Our top speed would be at a push 7.5 knot because we dropped the main sail to give us more manoeuvrability dodging these giants speeding past us at double our speed! Johann started to radio the first lot of ships to make sure they know that we are not planning a mass suicide, but are just speeding up towards them to hang around as close as possible to them to wait for the gap. He then radioed the next lot to ask for permission to cross the first ship’s bow … and hopefully make it before they reach us – So … when that gap opened up it was like one crazy charge with engines sounding like they are hitting the roof of the engine room! I was leaning forward unintentionally to almost help Scolamanzi over the line! It was such a relief to make it through the first lane of ships … we are now sitting (sailing) in the no-go-zone (the median strip between two lanes) and Johan decided that for the next hour and a half to leave me at the wheel and he went for a nap at that point… (how irresponsible of the Captain.. I thought!) – until we get to the next traffic lane! I was out of my mind by then…not sure that if I know how to judge the next gap! Radioing the first oncoming ship to make sure he can see us (to start with as I am sure they are not looking at anything other than the radar and might not see us?!) I was trying to negotiating the best way to go through! This time round it was a little easier with the traffic spread out a bit! What an experience it was! 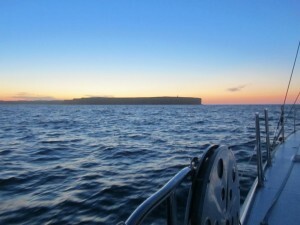 We were utterly relieved and dead tired (physically and emotionally) arriving at Cape of St Vincent’s coast …. by that time we have not had much more than 3 hours sleep in the last 24 hours (in fact … I think Johann had about 1 hour of sleep!). I was almost in pain from tiredness and just could not appreciate this new beautiful coastline slowing taking shape in the first morning light. I remember taking a picture of the coast line and then excused myself to go to the toilet (not to offend Johann – he was so excited to be in European waters at last! )…but instead I went and lie down in the saloon for 5 min just to get some relief from this excruciating pain! We were an hour and a half too early for customs and docked on the “welcome”-dock in front of the customs building until they open at 9am! Johann immediately suggested a cup of coffee and I suggested an hour sleep! We both got our ways! As if we somehow got a second wind … we docked inside the marina and immediately started cleaning the boat (it was drenched in salt water at some stage and salty spray made its way inside as well!) 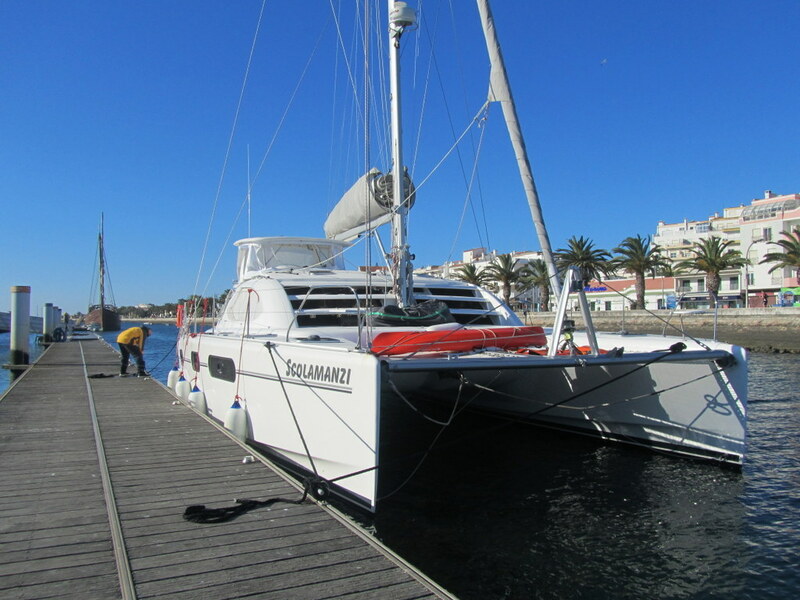 and at about 10.30am …the wind finally left our sails and as if we were shot down…. We both just collapsed and slept till 4pm that afternoon!